I love it when I can cook or bake and don't have to leave the house to buy ingredients. That was the case with these muffins: here in the Middle East dates are a staple in many households, and definitely in ours as my son loves to snack on them. They are a wonderful natural sweetener, full of natural fibres, and lots of vitamin B and iron. And with regards to the nuts, I think I have about 5 to 6 sorts in my kitchen cupboard, with almonds and walnuts also being bought by the kilo. My children love almonds. My son started eating handfuls of almonds when he was 20 months old. They are one of the very few things that my 2-year old daughter eats on a regular basis. I really believe that kids that age know intuitively what's good for them, provided that they haven't been fed junk from earliest age on. The walnuts go into my salads or in these muffins. The other nuts have been bought for "special occasions". So what else to say about these muffins? They taste good too. That's what I can guarantee you. In another bowl, combine egg, agave, yogurt, oil, and lemon juice and zest. Pour wet ingredients over dry ingredients and mix until just combined. Keep a couple of tablespoon of chopped dates and walnuts aside. Stir the rest into the muffin batter. 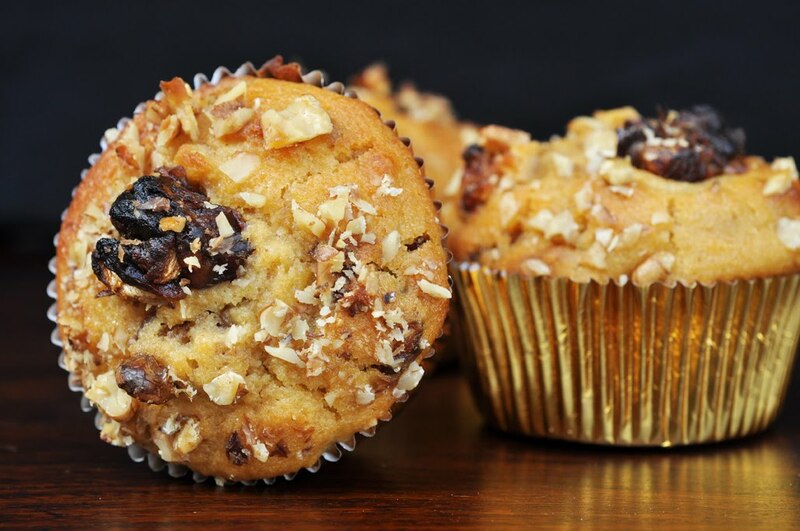 Fill the muffin moulds and use leftover dates and walnuts to garnish the tops. Bake for 20-25 minutes or until toothpick comes out clean.